Here's a very simple and easy method of identifying burned buffer boards LJ92-01203A / LJ41-02761A and LJ92-01202A / LJ41-02760A. Those are the buffers for Y-sustain LJ92-01200A. The trio is used in a great number of 42'' plasma TVs using Samsung plasma display technology (the display itself and the sustain/buffer boards). It is also famous for its common failure. The most common scenario involves burning the Y sustain which subsequently burns one or both buffers. Now, to the point: The most common defect in those buffers manifests itself in burning and shorting the power lines and some output lines. The easiest way to detect if a board was burned is to measure the resistance between its power input and ground. Normally it should be in the range of hundreds of kOhms and when burned it is usually a matter of Ohms. In fact, you can use the diode/audio test mode to determine if a board is burned or not. 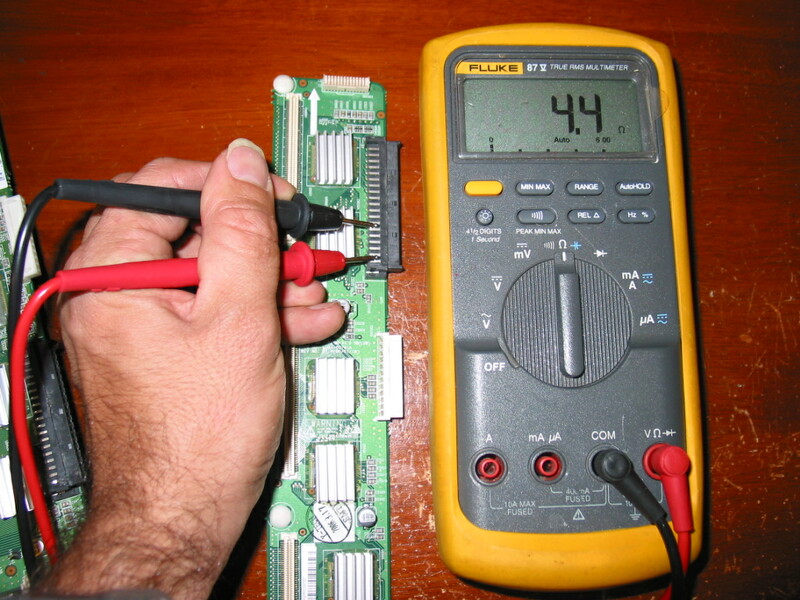 Still , in the below examples, I am using a multimeter in a standard resistance meter mode. On the TOP buffer board, the power lines are the top two lines of the black connector and ground are the most of the remaining connectors. On a good board the resistance between the two may be too big in the proper direction and about 500kOhm in reverse direction. The board on this picture is good. On the bottom board the power lines are the bottom two lines on the black board and ground is above them. 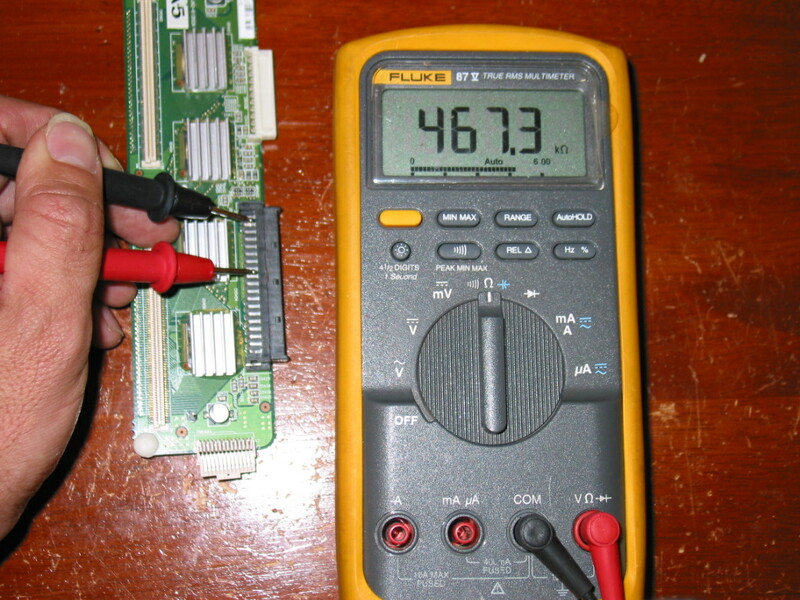 In the example picture on the right the resistance there is only 4.4 Ohm clearly identifying this board as a burnout. The resistance would typically be the same in both directions. This board would prevent the TV from powering on and may also burn the Y-sustain board. In a future post I'll also show how to identify the particular ICs on the burned board. Today I got a question: "What warranty do you give on your LJ41-02760A LJ92-01202 Repair Service?" Warranty is one thing I have always had problems with. Especially for electronic modules, whether new or serviced. As I explained the potential customer, the problem is that a faulty sustain board can easily burn a buffer and it would only take a 2-3 seconds to do so. I know it the hard way myself, in fact I still have that Y-sustain waiting for service on my desk. So how could one issue warranty to a part that can be installed and fried right on the spot? The simple and logical answer is - one shouldn't! Then how are customers protected? Well, in my opinion there are two options here: one is to break the above rule and hope that people , in general, are fair. In my opinion this is how Lehman Brothers, credit crisis and socialism in Russia all started. The second approach is to not trust people, but turst common sense instead. A customer's motivation to buy product or service is based on a balance of cost, risk and potential benefit. Presenting or pumping up warranty lowers risk for the customer and they get ready to buy. Since I don't want to turn to the next Lehman or the next Russia I say we don't touch warranty if we have no control over installation and use process and instead we play with the cost. I say I offer the cost low enough to get started - even if not profiting - and then slowly building a history and recommendations. Then I increase the price so I can actually make profit. An independant marketplace like eBay helps a lot for building credit through past sales. if a customer sees 10 other customers being happy before him he'll certainly feel more secure even if I do not offer warranty. Just a quick note to announce I now offer trade-in and/or repair service for power board 715T2907-2. This board is used in Insignia NS-LCD26-09 , Westinghouse W2613, Bush LT26M1CA and probably others. Typical sign for the problem is TV powers on and off (responds to buttons and remote), but screen is dark.